My favorite thing about this, from Fast Company, is the subject tag. "Technology." Oh man. The central issue was that Taco Bell's shells used a different type of corn masa than Doritos chips. But it wasn't simply a matter of adjusting the recipe. 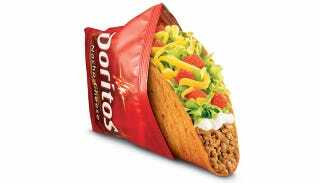 In order to create the DLT, the teams had to consider everything from seasoning mechanics to the taco's structural integrity throughout 2010 and 2011. "Frito-Lay wanted what's called a 'teeth-rattling crunch,' so they wanted it to snap and crunch more than the current Taco Bell shell snaps and crunches," Creed says. "So we had to get that formula changed, then we had to find a way to deliver the flavoring, and then the seasoning. I mean, it was actually important that we left the orange dusting on your fingers because otherwise, we're not delivering the genuine Doritos [experience]." No but seriously, it's great. Read it.